October 31, 1517, is perhaps the most important day in Protestant history. This was the day when Martin Luther, an Augustinian monk and a professor of theology, posted on the doors of the Cathedral of Wittenberg, Germany, his 95 theses (complaints) against the teachings and practices of the medieval Roman Church. With this event, the 16th century Protestant Reformation was formally born. • The re-establishment of the Scriptures. • Clarifying the means of salvation. • The restoration of congregational singing. “A Mighty Fortress” was written and composed by Martin Luther. The date of the hymn cannot be fixed with any exact certainty. It is generally believed, however, to have been written for the Diet of Spires in 1529 when the term “protestant” was first used. The hymn became the great rallying cry of the Reformation. A mighty fortress is our God, a bulwark never failing; our helper He amid the flood of mortal ills prevailing. For still our ancient foe doth seek to work us woe—His craft and pow’r are great, and, armed with cruel hate, on earth is not his equal. Did we in our own strength confide our striving would be losing, were not the right Man on our side, the Man of God’s own choosing. Dost ask who that may be? Christ Jesus, it is He—Lord Sabaoth His name, from age to age the same—and He must win the battle. And tho this world, with devils filled, should threaten to undo us, we will not fear, for God hath willed His truth to triumph thru us. The prince of darkness grim—we tremble not for Him; His rage we can endure; for lo! his doom is sure—One little word shall fell him. That word above all earthly pow’rs—no thanks to them—abideth; the Spirit and the gifts are ours thru Him who with us sideth. Let goods and kindred go, this mortal life also; the body they may kill; God’s truth abideth still—His kingdom is forever. Breathe a prayer of thanks to God for reformers such as Martin Luther, who laid the foundations for our evangelical faith. Praise Him on this Reformation Day for this truth. *Source: Ken Osbeck. “A Mighty Fortress,” Amazing Grace–366 Inspiring Hymn Stories for Daily Devotions, October 31 entry, Kregel, 2011. Anyone who follows this blog regularly already knows that I have been diagnosed with cancer. I begin my treatment today – 4-5 hours of chemotherapy and 24 minutes of Radiation. I will have 33 straight treatments with the hopes that my cancer will be killed. 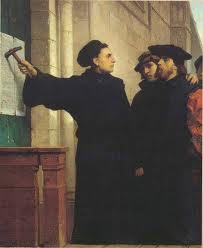 I don’t believe it’s by coincidence or an accident that my chemotherapy and radiation treatment begin on October 31st – the day that Martin Luther nailed his 95 Thesis to the Church Door at Wittenberg, Germany. 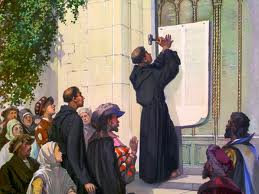 Luther’s 95 Theses sparked perhaps one of the five most significant days in Church history since the closing of the Canon of Scripture on any church historian’s list of significant days. (2) I thank God for what theologians call “common grace.” Two of the people that have helped me the most since I’ve been diagnosed with cancer are not followers of Christ. And yet, I am so grateful for their advice, wisdom, and compassion in my battle with cancer and all the medical procedures I’ve had to go endure so far. I am grateful for doctors, nurses, pharmacists, and others who have come alongside me with an expertise in their particular areas in treating cancer. It is a common grace that all truth is God’s truth. The rain falls on the wicked farmer’s and righteous farmer’s crops alike. I am reminded that all people are made in God’s image and though they may not share my passion for Christ and God’s Word – they are special and many share an affinity for objective truth’s and helping their fellow man. Luther was helped by many who were not followers of Christ in helping bring about the Reformation of the church and the Gospel. In the Bible God uses men as wicked as Judas to bring about His purposes. (3) I am grateful for God’s sovereignty. I know that nothing can happen to me that He does not allow. R.C. Sproul likes to say there is not one single maverick molecule that is not under God’s control. I believe that God can kill my cancer without chemotherapy or radiation treatment. Many family members, and friends, and even Christians I don’t even know, in different parts of the world are praying for me. I feel totally humbled by this outpouring of love. Elders, my mom, and several close friends have anointed me with oil. However, the cancer is still there. As of today I still have cancer that needs to be killed through the means of God’s people praying, medications, radiation and chemotherapy treatment, and the various nutritional cancerous killing foods I’ve been eating and drinking. However, no matter what happens I know that God is sovereign – in control of everything (including my cancer), and that He is good – He will be glorified no matter what becomes of my cancer. Luther was not perfect – as a matter of fact that’s why he was so passionate about the Bible. In God’s sovereignty He raised up a brilliant and yet very bombastic theologian to shake things up in the Church. I don’t claim to be brilliant, nor too bombastic, but I do know that God will bring about good and the glorification of His Son on a much smaller scale in sovereignly using my cancer for His ultimate purposes and plans – and that is extremely comforting. The fact that no one, no thing, no ruler, no nation, no disease – can thwart the sovereign plan of God to bring glory to Himself. (4) Luther said that suffering helped him understand the Bible, and that without experiencing pain and suffering you can’t be a good theologian. I strive hard to be a good interpreter and teacher, but I totally concur with Luther – suffering makes you a much better theologian. I don’t like suffering or pain any more than anyone else. But I think that the emotional pain that led to physical pain for the advancement of the gospel in Luther’s life was worth it. It was worth it for me, and worth it for you. I’m so glad that I know salvation by grace through faith in Christ alone because Luther’s heritage has been passed down for almost 500 years. Before him it was taught by all of the apostles in the New Testament. It is extremely clear. But nothing good, comes easy, or without a cost. We have the phrase in America – “No pain, no gain.” Without Christ’s suffering and pain on the cross there would be no spiritual gain in any way, shape, or form in our standing with God. I stand amazed at Jesus’ voluntarily leaving His rightful place with the Father and Spirit to come to planet earth to pay the ultimate price and be the one and only sacrifice for our sin. He is able to empathize with our sufferings and weaknesses, and is yet without sin. Today I stand as Luther did on the truth of justification by faith alone in Jesus; in God’s common grace through the expertise of the doctors and nurses and the medications they will use to kill my cancer; in the sovereign will of God working all things together for my good and His glory; and I’m prepared to suffer because in Christ I know that His sufferings were greater still and for a greater good; no matter what happens – as Luther was able to say “Here I Stand” – I can also stand firmly today 495 years later because of Jesus the Nazarene. ‘twill be my joy through the ages to sing of his love for me.